Go Auto Companies vision is to be a manufacturing hub for China SUV in the EEV category focusing on Internal Combustion Engine ( ICE ) and Electric Vehicle ( EV ) for ASEAN market. Go Auto was established in 2013, its core business in automotive with multiple businesses namely manufacturing, contract assembly, sales and distribution, after-sales services and spare parts sales. Go Auto has entrenched itself by receiving the first Energy Efficient Vehicle ( EEV ) manufacturing license from the Ministry of International Trade and Industry ( MITI ) on April 2014 under the new National Automotive Policy ( NAP ). With the introduction of Haval H1 ( earlier named as GWM M4 ), they are currently embarking their business upon Electric Mobility. Via recent technical collaboration with a prominent technology provider company, Go Auto is now keen in developing the facilities for Research and Development for EV system components and production facilities. Go Auto is the exclusive manufacturer for GWM and Haval SUV from its factory and diverse their capabilities as the contract assembler for other automotive brands from China such as Dong Feng trucks, Mian Yang Jinbei light trucks, ATV for Adly and others with their flexible and lean production line. They also export 30% to 40% of their vehicle production to ASEAN countries such as Cambodia, Brunei and Batam, Indonesia. 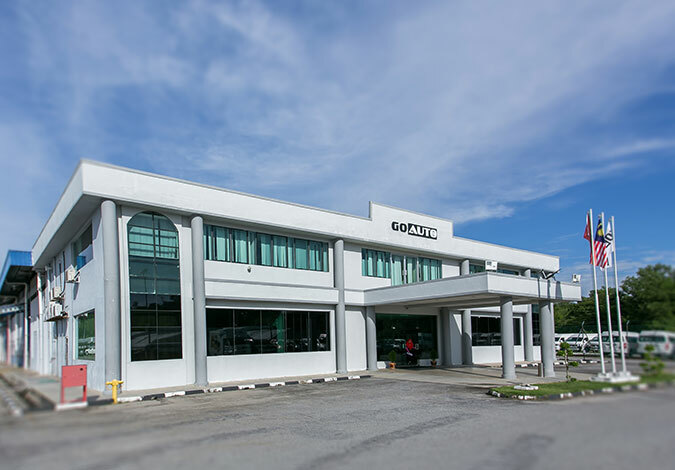 Even though Go Auto Companies is a new local automotive manufacturer and assembler in the industry, the management and team members are in fact seasoned players in the Malaysian automotive industry. They have strengths, knowledge and know-how starting as a full-fledged manufacturer from ground zero and introducing new models from styling to mass production as well as sales and aftermarket services. They also inculcate young executives in the organization with best practices and awareness on high quality deliverables. Go Auto, besides its manufacturing business, the companies also incorporate other businesses such as property, construction, agriculture & live stock, car rental & trading. Go Auto is constituted by five business divisions : Go Automobile Manufacturing Sdn Bhd, Go Auto Sales Sdn Bhd, Go Auto Services Sdn Bhd, W&R Resources Sdn Bhd and W&R Trading Sdn Bhd. All these divisions contribute to the constitution of the successful Go Auto Associate Company. Behind Go Auto lies a team of young professionals with diverse backgrounds. This team abides by the “BFF” concept of Go Auto, which is “Bright, Friendly and Flexible”. They ensure that the visual management system is always in check, they maintain openness and are continuously learning so that the manufacturing procedure of all kind of vehicles is highly flexible and productive. Copyright © 2019 Go Auto Group of Companies. All Rights Reserved.